This morning The Walls Group stopped by my church home- The House of Hope Atlanta to minister to us for Youth Sunday. I meant to grab a photo and chat with someone, but they slipped by me. It's just my luck that one of my favorite blogs- The Brandy Blog- was able to chat with the four. As I previously reported, the group was recently in the studio with my fave, Brandy recording what I knew would be some sort of incredible record. Now, thanks to TBB we know just a tad bit more about the collaboration. In the below video we also get to hear the siblings jam the hook of one of Brandy's throwbacks- Always On My Mind. I too grew up singing with my siblings- we still have to get up at my Father's church whenever my mom or somebody requests it. To see them today made my heart smile because there is nothing like singing with family. They jammed out today and really ministered. The Houston natives shared their single Satisfied from their upcoming EP, and they churched us a little bit too -as they do so well. Man I love these four. To see where God has brought them from the time I first witnessed their insane harmony and skill years ago on youtube is truly amazing. 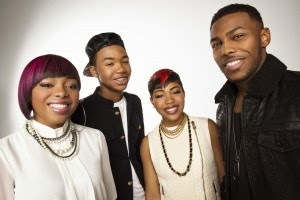 Check out their brief exclusive with The Brandy Blog below and please be sure to support them! Maybe just maybe we'll get a KayKiSpeaks.com exclusive. I'll be the best Tia ever to my nieces and nephews if I make that happen.